This event will be held at our 9th Ave. location. Jeffrey Thomas Leong discusses his new book of translations Wild Geese Sorrow: The Chinese Wall Inscriptions at Angel Island with UC Berkeley Asian American Studies Librarian Sine Hwang Jensen. Wild Geese Sorrow: The Chinese Wall Inscriptions at Angel Island by Jeffrey Thomas Leong is the first new translation in almost 40 years and takes readers through the deep anger, sorrow, and loneliness felt by the Chinese immigrant detainees at the Angel Island Immigration Station between 1910-1940. Sequenced to narrate the detainee experience, the poems tell of arrival, long detentions, medical exams, political outrage, and for some, deportation. Readers will also learn the nuances of literary translation and about a critical period of American immigrant history, so essential to our contemporary policy debates. Availability: On Our Shelves Now. Call store for up-to-the-minute availability. 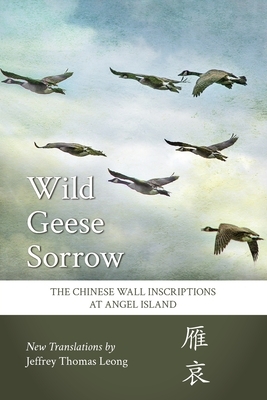 Wild Geese Sorrow: The Chinese Wall Inscriptions at Angel Island by Jeffrey Thomas Leong is the first new translation in almost 40 years and takes readers through the deep anger, sorrow, and loneliness felt by the Chinese immigrant detainees at the Angel Island Immigration Station between 1910-1940.